Linear Technology has just announced a neat little chip (LTC4412). It has been designed to be used in conjunction with an external P-channel power FET, to form an ideal diode function with a very low 0.05v voltage drop. The chip monitors the voltage on either side of the FET. As long as the voltage on the drain side is greater than the source side, the FET is turned on. The device controls the voltage at the gate of the FET to maintain a voltage drop of about 0.05 volts across the FET. When the current direction tries to reverse, the hobby circuit senses the voltage polarity change and turns off the transistor, blocking the current. This action mimics how an ideal diode would function. The circuit below shows how this device can be used with a FET from International Rectifier, to form an ideal diode with a rating of 20 Amps and a voltage up to 28v. How are these devices used? Let�s suppose you owned a recreational vehicle (RV). When the RVs engine is running, you would like the engine�s alternator to charge both the engine�s battery and the battery used in the RV. But, when the engine is off you don�t want the 12v RV loads to pull current from the engine battery. Likewise, you don�t want to pull current from the RV battery when the engine is running. One way to solve this problem is with the use of two diodes. The alternator output of the engine is fed to the anode side of two power diodes. One diode routes current to the engine�s battery while the second diode routes current to the RV battery. The diodes block any current path between the two batteries. In a conventional circuit, two high current diodes would be used. But, since there could be a sizeable current passing through the diodes, they have to be mounted onto a large heat sink, to be able to handle the power dissipated in the diodes. The circuit shown below is much more efficient. 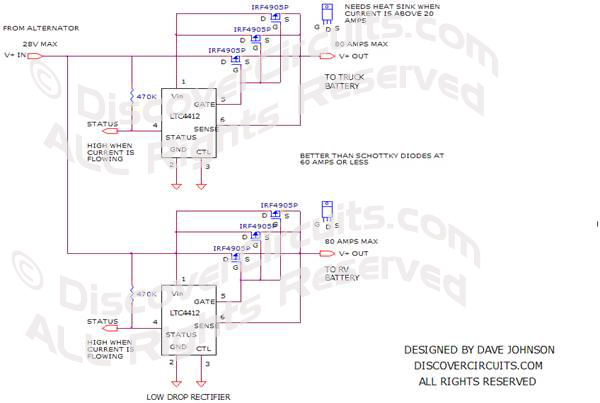 It shows this battery isolator using two ideal diodes. With the components shown, the electronic circuit should be able to handle 60 Amps of current to each battery.